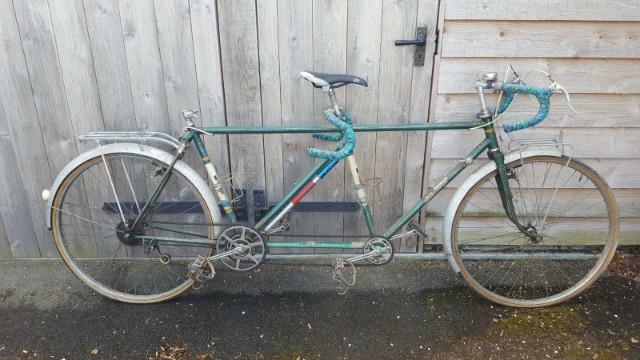 Jack Taylor tandem, 'Sports' Model, 22" front, 21" rear, Reynolds 531 tubing, Frame No. 5359 so built 1965, bought secondhand by me in as-new condition in 1976, toured regularly but not used since 2003 (bought Santana, tandem No.2). Flamboyant Green with white double box lining. Largely authentic, 27" wheels, five wide ratio gears, rear cassette 14-28, Mafac brakes, Lefol guards, front and rear carriers added in 1970's, needs new saddles and tyres. good condition, but with some minor rust spotting through paintwork. Lovely to ride but we have progressed (regressed?!) to tandem No. 3, with electric assist. Please email for further details and photos.